For some pet owners, losing their companion is traumatic, resulting in funerals and burials. When Jim Walsh held his beloved dog Chrissy for the last time, he had to endure his grief alone. His family was at work on the day when Chrissy — a bichon frisé already in poor health — broke his leg. And the veterinarian, although efficient in administering the lethal drug that euthanized his pet, was not so adept at offering a shoulder to cry on. Worse, when his family heard that Chrissy was gone, they were upset at not having been present for their dog’s final moments. So Walsh, a funeral director, opened Adoring Pet Funeral Home and Cremation Services in Fraser earlier this year, several doors away from his funeral home. Adoring Pet has handled arrangements for guinea pigs, iguanas, ferrets, and one horse. But most of the families Walsh serves are mourning dogs or cats. Among them was Pat Caran of Sterling Heights. When her Angel — also a bichon frisé — died of a heart attack in February, she ordered a full funeral for him at a cost of $1,150. Angel lay in an open casket at the funeral home while Caran and her family received visitors offering their condolences. The funeral home, the casket, and other elements of Angel’s burial are just a small part of the pet-bereavement industry, a business that’s growing here and across the country. Card shops, such as Write Impressions in Royal Oak, stock pet-death condolence cards. Amazon.com lists more than 200 book titles on the topic of pet loss. Pet cremains may now be stored in a special carved wooden urn on the fireplace mantel or in a pendant stamped with a paw print. Bereaved owners can communicate via online chats with others suffering a similar loss. Online, they can also create a virtual pet memorial. No one tracks the size of the pet-bereavement industry, but it’s a significant part of the $46 billion Americans spend on their animal companions each year. And pet spending seems to be recession-proof, with sales increasing every year, the American Pet Products Association reports. 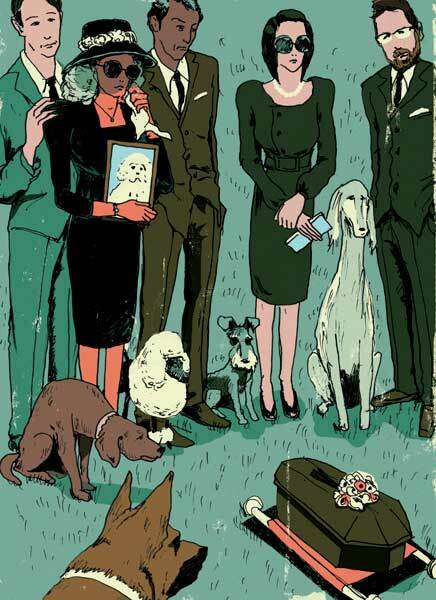 Michael Shaffer, author of One Nation Under Dog, attributes this to our pets’ transformation from man’s best friend to what marketers call “fur babies.” As the divorce rate rose and family members moved to far-flung parts of the country, human connections splintered and animals filled the gap. Lawrence started the group four years ago as a project between the MSU School of Social Work and the university’s College of Veterinary Medicine. She said listening to other people’s stories is therapeutic to a grieving owner, the biggest benefit being the realization that you’re not alone in your sorrow. Kerri Collier, owner of Great Lakes Pet Memorial & Crematory in Traverse City, says that it has been her experience that men are the most emotional about deceased pets. Almost always a husband calls to inquire about her services, but when he breaks down, his wife gets on the line. As if to prove Collier’s point, a GMC Denali SUV pulled into her crematory parking lot recently while she chatted with a reporter. A rugged-looking man got out, walked in, and told Collier he was seeking an urn for his dog’s cremains. He wasn’t there two minutes before his tears were flowing. Mark Maier, owner of Thunder Bay Taxidermy in Alpena, knows well the value people place on their pets. His services for freeze-drying pets — the preferred method of preservation, he says — start at $700. It takes at least three months to preserve the animal in one of Maier’s four dryers. Some people get them under glass, but most put them out in the living room or something, he says. Especially lifelike are cats that look as if they’re sleeping. Carol VanDenBosch is one of Maier’s clients. She had her 5-year-old Maltese, Mary Miss Sunshine Hug, freeze-dried earlier this year. Maier mounted Sunshine on a piece of cherry wood and bleached out some stains around the longhair’s eyes. “I wasn’t sure how I would feel,” says VanDenBosch, a Midland-based portrait artist. “In my mind, I thought maybe I’d get all creeped out and couldn’t stand it.